Hi everyone! How are you at organisation? I always thought I was pretty good at it - but with two kids, working part time and just the general chaos and busyness of life it's not always easy to keep your household running like clockwork. 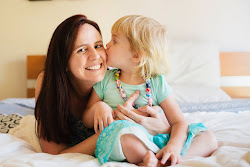 Today, guest blogger Erin (you may have read my interview recently) has some fantastic organisational tips to keep the household running like clockwork, ultimately leaving you with more time to actually play with your kids! ...so if you are anything like me, you are always on the hunt for fresh ideas to keeping the home, routines, family as organised as possible. Today I am sharing eight ways to help keep your family organised so you have more time for play. These ideas are nothing new, we didn't create them (other than our version of #8), these are ideas that we have seen and/or adopted from various experiences and influences. Some we have changed to meet our needs and others we have simply followed in the original form. By using these systems, we have found there is more opportunity for family adventures and PLAY! Planning all our meals (breakfasts, lunches, dinners and snacks) has made cooking and food preparation easy, alleviated stress, eliminated waste and encouraged variety in our household. After trawling online for ideas and inspiration, lots of trial and error and changes as needed, we finally have a system working for us and are continuing with this for now (yep, it will change as required). This system involves using a laminated weekly meal planner , weekly grocery shop, a planning day and a baking day (half a day). The planner is filled in once a week on a scheduled 'planning day', the recipes come from a master list of family favourites, Little Bento World Sandwich Filler printable, online sites such as My Lovely Little Lunchbox along with The Organised Housewife. Mornings set the tone of the day for us - they either energise us or drain us. Our morning routine came about with the combination of trial and error and inspiration from our favourite authors and bloggers. And even now, it still doesn't always go to plan - as that is the nature of life, but the key to success for us has been to keep it simple. We have kept it simple by choosing 5 things to complete each morning (aka Daily 5) because this is what we can manage. The children's morning routine has also been simplified to 5 daily tasks too and their routine is displayed visually with routine cards (more on this further down). The intention was to keep these five tasks the same until they became daily habits and once they were a part of our everyday life, consider introducing new tasks as needed. This concept was inspired from Leanne over at Organising the Four of Us. Check out her page to learn so many more handy tips on organisation, particularly Project 14 and how to join. Afternoons - work much the same way with daily tasks, however, there are only 3 tasks. This fits in our current afternoon schedule. If you choose to adopt this idea, you may find you can fit in more or less daily tasks pending on what works for your family. Creating visual timetables with routine cards for all family members is a great way to keep track of schedules, responsibilities and holds everyone accountable for their organisation. Did you know that our brains are hardwired to love routine? ...so even if things in our homes seem chaotic and somewhat disorganised, there is a pattern in there somewhere. There is a multitude of information and routine cards online to find which ones best meet the needs of your family. I have linked the routine cards we use above. I like to keep a track of our daily activities on paper (I am a list person) even though our schedule is often jam packed, seeing it on paper makes me feel like I have a handle of things. Our usual planner wasn't available this year, so we created our own. We record our daily schedule, daily 4 (priorities for the day), to do list (aka the rolling to do list -the jobs that seem to roll on for a few days until they are completed - surely I am not alone on this, right? ), meals, appointments, self care and shopping. Organisation stations are not a new idea and in fact most of us have them in some way, shape or form. Launch pads (sometimes also known as command centres or mud rooms) hold a family's everyday items that are needed to get ready and out the door in a timely manner - from school bags, to handbags, to calendars, to planners, to homework, to shoes and uniforms. They are best known for their ability to create smoother morning and afternoon routines for both parents and children. Check out these launch pads for inspiration to get one started in your home. This organisational system has been a game changer in our household. Hands up if you find yourself running back and forth in your home returning misplaced (aka stray) belongings? If this is you, this idea is just what you need. It is a box in a central spot to place those loose items, eliminating the constant back and forth, until you have the time to return them in one go. This has been a huge organisational success in our home. This year we combined two of our greatest passions (organisation and play) and created a Play Planner for use in our home . It is a place to schedule our weekly play activities, set goals, store an inventory of our play resources, record our children's current interests and achievements along with ideas for purchasing new play resources which makes it easier to come up with gift ideas for ourselves, family and friends come birthday and Christmas times. ...so how do these systems create more time for play? In having each family member know what is expected of them and with less time spent on daily routine based instructions, there is more time for the fun things - such as play and family adventures. Play is an important part of our children's and families lives - even adults benefit from play. It helps us grow, learn and develop skills in a multitude of areas that assist the way/s in which we live and relate to others. As an educator and a Mum, I often hear parents wish they had more time to play with their children and/or more play ideas on how to provide their children with varied positive learning experiences particularly at home and I get it. It can certainly be a tough gig on top of juggling the demands of everyday living...so jump on board...start your journey here with one of the ideas/systems mentioned above that has most resonated with you and away you go. Now, I know that the Teacher Types community has a wealth of knowledge and experience with play and organisation, so if you have an idea, handy hint or suggestion, please share it with us in the comments. We can learn so much from those around us and it is always nice to help and even inspire a fellow Mamma.